There is a wonderful and magical phenomena that sometimes occurs when items are grouped together in a jar; it creates a sort of time capsule which not only encapsulates the items on display, but also emotion and memory. I find this to be true in my collection of small toys. I love collecting toys for many reasons, but one of my favorite reasons for collecting vintage toys is the reaction I get from others. I can't tell you how many times someone has looked into a jar of toys and has pulled out a memory. The collection becomes far more than something in a jar sitting on a shelf, but is rather a catalyst to something much more meaningful. 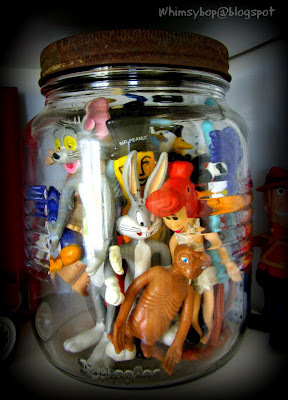 This time capsule is full of toys mostly from my Saturday morning cartoon days. Thinking of my favorite cartoons, I am transported back to those days when there was only one television in the house which only had a few choice channels. It had no remote control and we had to turn it on then wait to let it "warm up" for a few minutes. I would always try to wake up early to allow enough time for my favorite shows before having to do the family ritual of Saturday morning chores. An endearing part of those cartoon days were the interruptions of "School House Rock" intermissions between cartoons; I still remember them to this day - a genius idea! This jar, full of yo-yos, bouncy balls and jacks comes in handy when kids are bored and need something to keep them busy. The collection is always kept at eye level so when kids visit our home, they will find it easily and feel comfortable to reach into it and pull out something fun and familiar to play with. I remember playing jacks on the hardwood floor in the living room on long summer days with my Mom and sisters. This collection of vintage agility games, also known as dexterity puzzles, remind me of the games that my siblings and I would play when we visited my Grandma's house in Cleveland (I can't remember if they were her games or if we brought them with us). The game I remember most was a handheld "Tomy" basketball game that was filled with water, (my siblings and I had a waiting list to play that one). 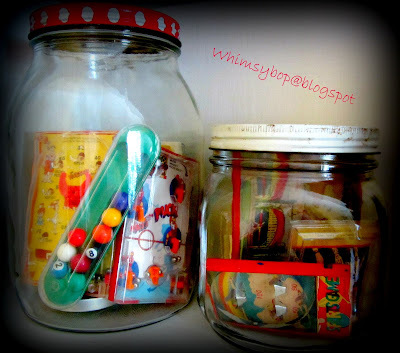 The agility games in these jars are proof of a failed attempt to collect enough of them to hang on our game room wall. I had to finally stop because they were hard to find, and I could only find them at on-line auctions selling for unaffordable high prices. A few of my favorites are from the 1940's and made of tin and beautiful lithograph drawings of submarines, battleships and airplanes. 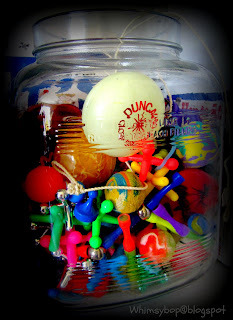 The idea for this jar full of toys (center) came to me after I saw the DisneyPixar movie: Toy Story 2 and bawled my eyes out when Jessie the cowgirl sang her song: "When somebody loved me," (go to http://www.youtube.com/watch?v=px0j1EHF8Y0 and see what I mean!). Shortly after watching the movie I started finding toys around the house that my kids used to play with, so in honor of Jessie the cowgirl and toys like her, I felt it my obligation to memorialize them in a jar. The note inside says: "Childhood - All too swiftly passes away." This last jar contains tokens, houses and cards from my all-time favorite board game: Monopoly. We didn't own a lot of board games when I was a kid, but we did own Monopoly and played it most during winter and summer vacation and cold, rainy days. Sometimes my brother, sisters and I would play a perpetual game that would last for an entire weekend. My brother always seemed to triumph over the three of us girls - sometimes bartering our household chores in lieu of paying him Monopoly money owed to him when we'd land on Boardwalk or Park Place with a hotel on it (My brother the real estate tycoon!). 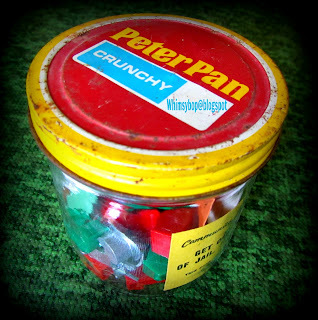 Take a look at that old Peter Pan Peanut Butter lid - is that a classic or what? It wasn't too long ago when everything came in a glass jar, now most jars are made of plastic - even Mrs. Butterworth's syrup now comes in plastic (gasp!) ...What is the world coming to?